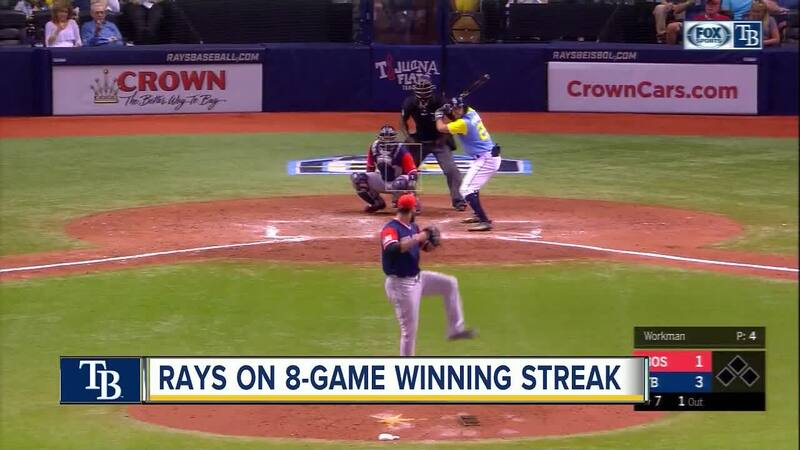 ST. PETERSBURG, Fla. (AP) -- Blake Snell had his best fastball and that was more than enough against baseball's best team. 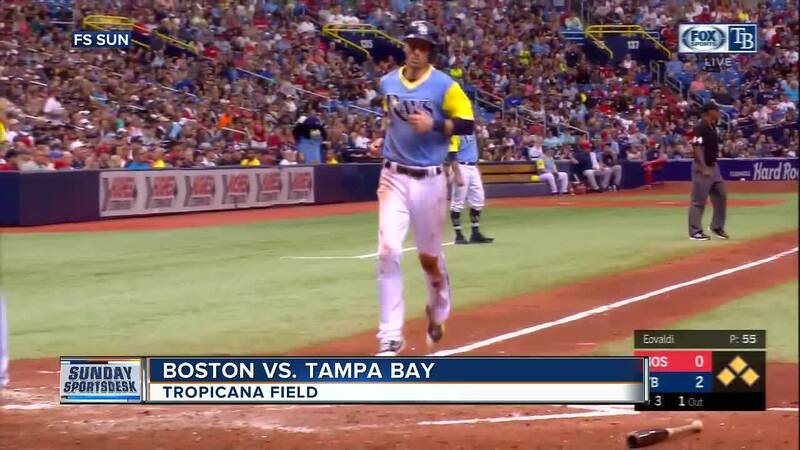 The All-Star lefty pitched two-hit ball over six innings and the Tampa Bay Rays won their eighth straight game Sunday, beating Boston 9-1 to hand the major league-leading Red Sox their first sweep of the season. "There was a lot of energy today," Boston manager Alex Cora said, "but the guy on the mound sucked it up." Snell (16-5) allowed one run and struck out eight. He has given up no more than one earned run in 14 consecutive starts at home, and he has a 1.08 ERA in four outings against the Red Sox this year. Boston (90-42) has lost six of eight and was outscored 24-5 in the three-game set. Duffy had three hits and drove in two runs for the surprising Rays, who completed their first undefeated homestand of more than one series. They won all seven games against the Royals and Red Sox, and are nine games above .500 (70-61) for the first time since June 2015. "For us to do it against Kansas City and then Boston, the best team in the league right now, to be able to do that to them says a lot about our team," Snell said. "I'm excited to be in this clubhouse with these guys." Red Sox starter Nathan Eovaldi, acquired from the Rays in a July 25 trade, gave up hits to the first three batters he faced and fell behind 2-0. Kevin Kiermaier's two-run triple was the fourth hit off Eovaldi in a three-run third that left Tampa Bay with a 5-0 lead. "They're a very streaky team," Eovaldi said. "They've had their ups and downs. Right now they're swinging the bats as well as anybody. The pitching has been pretty good all year." Eovaldi (5-6) dropped to 2-2 with Boston. He gave up six runs -- five earned -- and eight hits in four innings while striking out five. In his last four starts, the right-hander has allowed 35 hits in 17 innings. Cora said he never reconsidered his plan to give slugger J.D. Martinez the day off before Monday's scheduled open date. "We haven't done two days off with him the whole season," Cora said. "With him it's about the mechanics -- he's always afraid that he's going lose it. But I think at this stage, two days will benefit him." Red Sox: LHP Eduardo Rodriguez (right ankle sprain) will attempt to pitch six innings in a rehab start Monday. ... RHP Steven Wright (left knee inflammation) will throw to catcher Christian Vazquez (broken finger) at Triple-A Pawtucket on Tuesday. Rays: Manager Kevin Cash said OF Mallex Smith (viral infection) is "doing considerably better" and was expected to be released from the hospital Sunday. Cash has no timetable but didn't rule out Smith, who was hospitalized Friday, from playing again early next month. Red Sox: RHP Brian Johnson will pitch Tuesday night in the first of two home games against the Miami Marlins. Rays: After their first day off in two weeks, the Rays open a two-game series in Atlanta on Tuesday night. Ryne Stanek will start.